The Green Housing Preservation Program (GHPP) is a first-of-its-kind green loan program from the New York City Department of Housing Preservation and Development (HPD) for small-to-mid-sized building owners (5-50 units). GHPP provides forgivable and no-interest loans for energy and water efficiency improvements, and low-interest loans for moderate rehabilitations. HPD estimates that participating buildings may reduce utility costs by at least 10%. GHPP will help you make your buildings greener, cleaner and more affordable. In partnership with HPD, NYCEEC offers attractive financing for any predevelopment expenses associated with participating in GHPP — enabling all eligible building owners to enjoy the program’s benefits. NYCEEC can finance up to $40,000 in predevelopment expenses for up to 18 months with a simple and straightforward approval process. Ready to apply? Here are some resources to get started. If you’ve already spoken to HPD and found out you’re a good fit, download and complete NYCEEC’s short loan application here. 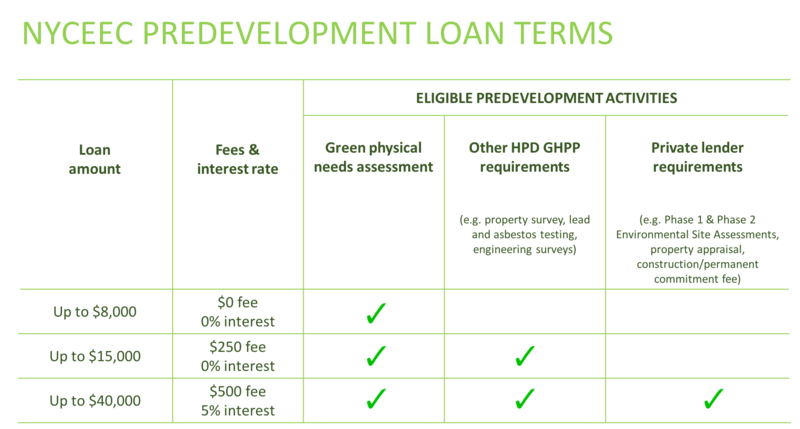 To learn more about NYCEEC’s predevelopment loan terms and eligible expenses, download the full term sheet here. If you have questions about how NYCEEC’s GHPP predevelopment loans might work for you, contact us today!